Smatterings of snow, icy waters and clear blue skies. Rocky landscapes covered in heather, grazing sheep and trickling streams. Welcome to the Isle of Skye. After Edinburgh’s Hogmanay celebrations were over I headed up into the wild Scottish highlands with HAGGiS Adventures for three days of beautiful scenery, tales of faeries, giants and clan histories. This was as part of their Skye High trip. 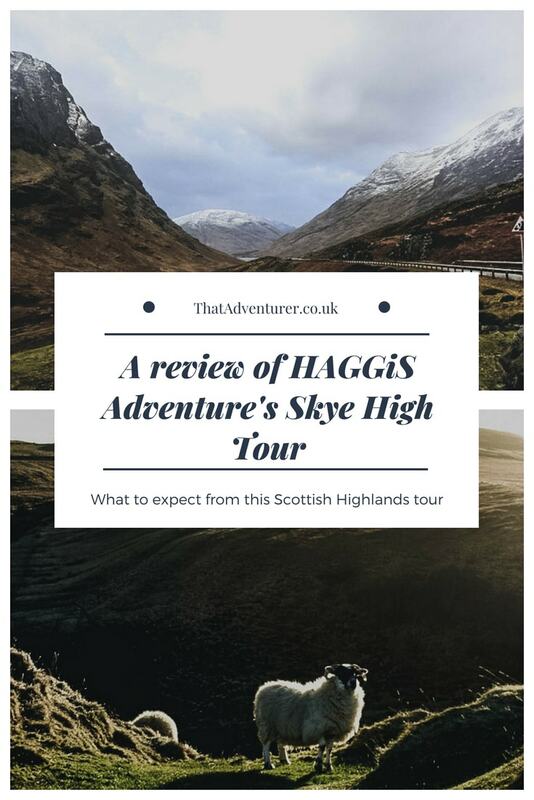 If you’re considered taking a tour of the Scottish Highlands with HAGGiS adventures, then check out this review of HAGGiS Adventures Skye High. 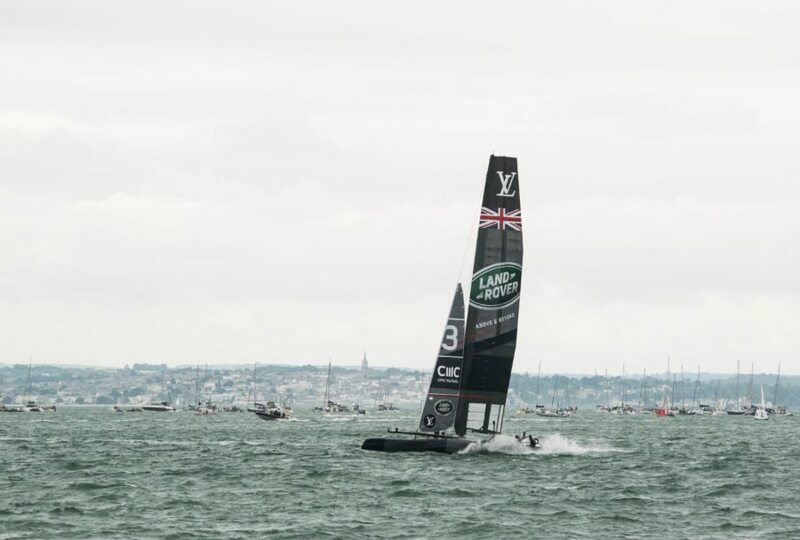 This review includes details on what you’ll see and do and the accommodation. What are the highlights from the Skye High Tour with HAGGiS Adventures? Who’s the Skye High Tour best for? Where does the Skye High Tour leave and return to? How much is the Skye High Tour? HAGGiS Adventures has been running since 1993. Their mission is to make every trip they run the best yet. On each trip they share Scottish culture, history, myths and legends with their guests so you’ll also learn a lot as well as have a great time. 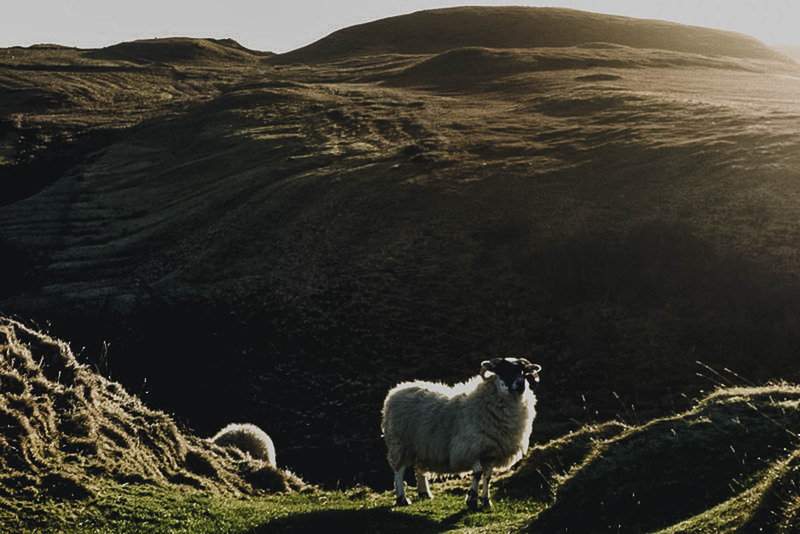 If you’re in Scotland for a short amount of time and want to take a trip to the Scottish Highlands then the Skye High Tour is a great way to do so. 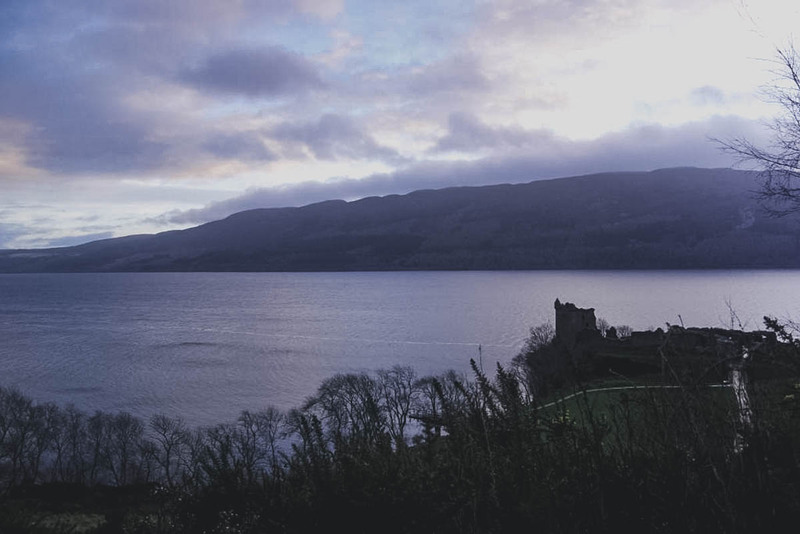 During this tour you’ll get to go Nessie hunting, see ruined castles, lochs, mountains and have the chance to taste some real Scottish whisky at a distillery. 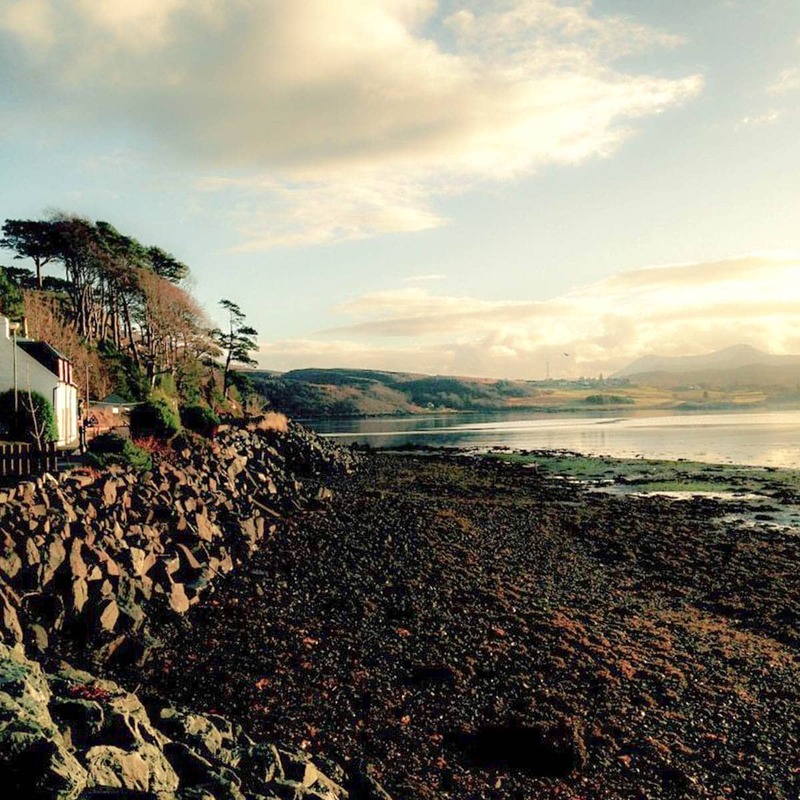 You’ll also spend a day exploring the beautiful Isle of Skye. Think wide open skies, incredible coastline and a gorgeous Scottish castle: Eilean Donan. Along the way you’ll be told Celtic myths and legends from your guides and spent a couple of nights in Highland pubs. There are so many highlights on the Skye High tour with HAGGis Adventures. 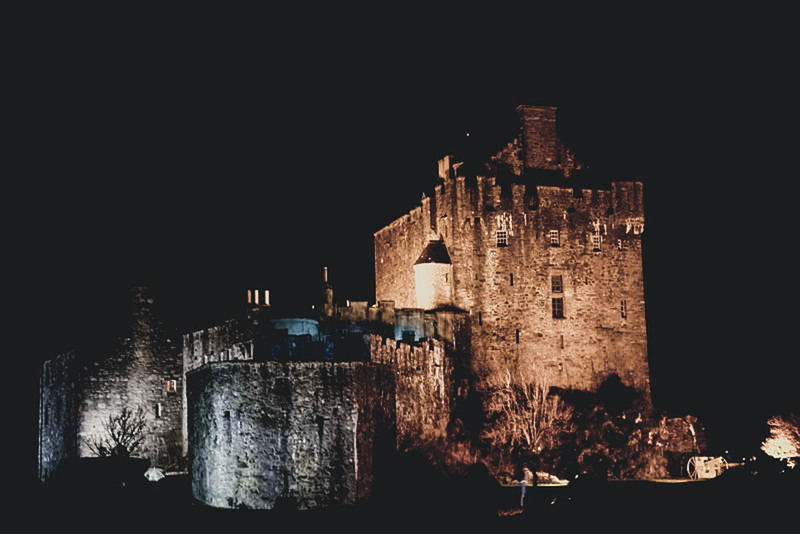 You’ll get to see Glencoe which is a photographers ideal landscape, sleep on the banks of Loch Ness, learn about the (very) bloody history of the Highlands and take in the beauty of Eilean Donan Castle. They’re good for everyone but especially solo travellers and the budget conscious! There are quite a few solo travellers on tours like this. Since you’re on a bus together it’s a great way to meet fellow travellers along the way. After meeting our guides, Paddy and Greg, we boarded the bus and headed north from Edinburgh. Along the way we were taught about the clans that used to roam the highlands and engage in bloody warfare. 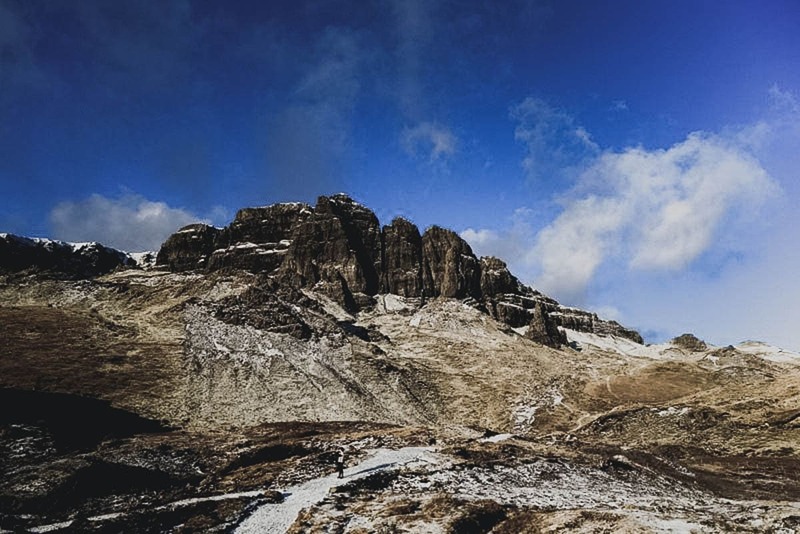 The Macleod and Macdonald clans came to dominate the Isle of Skye and the rivalry between the two caused a huge amount of bloodshed for centuries. The most notorious of all incidents led to the Battle of the Spoiling of the Dyke in 1578. In revenge for the massacre of hundreds of MacDonalds in a cave used as a place of worship, the MacDonalds landed on the Isle of Skye and barred the doors or Trumpan Church when it was full of worshippers. The MacDonald clan set the church on fire and no one escaped, except for one fatally wounded girl. The MacLeod chief then set off for Ardmore Bay and almost every MacDonald was killed in the ensuing battle. The corpses were dragged into a turf dyke, giving the battle its name. Here’s some more information on the bloody warfare between the two clans. 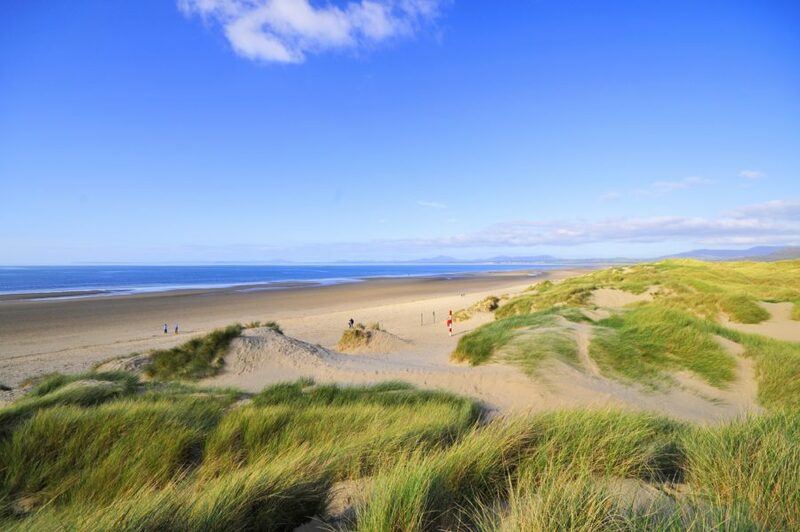 Although a blood thirsty history, the windswept landscapes are undeniably stunning. Driving through Glen Coe, passing the shadow of Ben Nevis and ending on the coast where an illuminated Eilean Donal castle stands, had me thinking of how easy a decision to move to Scotland would be. If would seem I’m not the only one who has been taken in by the Highlands. The following day, having woken up on Skye, my HAGGiS Adventures guides tell me that the population on Skye is growing as more and more people try to escape other people. Quite the paradox. The Isle of Skye, or the isle of mist, is everything you’ve ever imagined it to be. It’s rugged scenery and brooding mountain ranges are commonly featured in films and television series. The island is rife with tales of tricksy faeries; ones that are a lot more mischievous than the likes of the tooth fairy! Take the faeries that kept a man underground playing bagpipes for them for several decades for instance! He thought he’d been playing all night and only discovered the trickery of the faeries that had enticed him down there when he returned to his house to discover no one had ever heard of him. 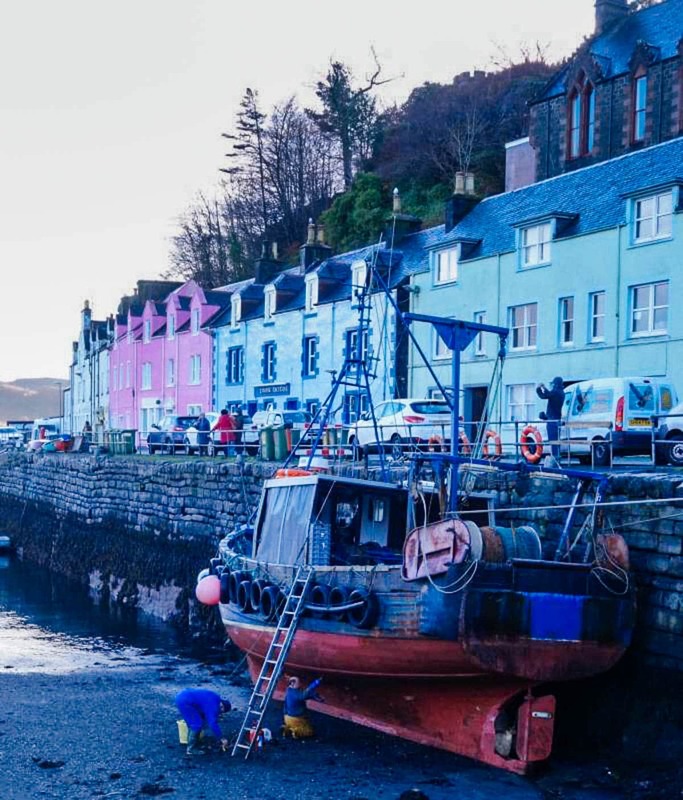 We visited the little town of Portree on Skye for a tasty fish and chips. Then took a stroll around the harbour to take in the colour buildings and fishermen’s chit-chatter. For a trip abound with myths and legends, this doesn’t cease on the third day of my HAGGiS Adventures. Having slept near the Loch Ness, our HAGGiS bus drove its entire length. I kept my eyes peeled trying to sneak a peak of the reclusive creature whilst Paddy told us carious tales. 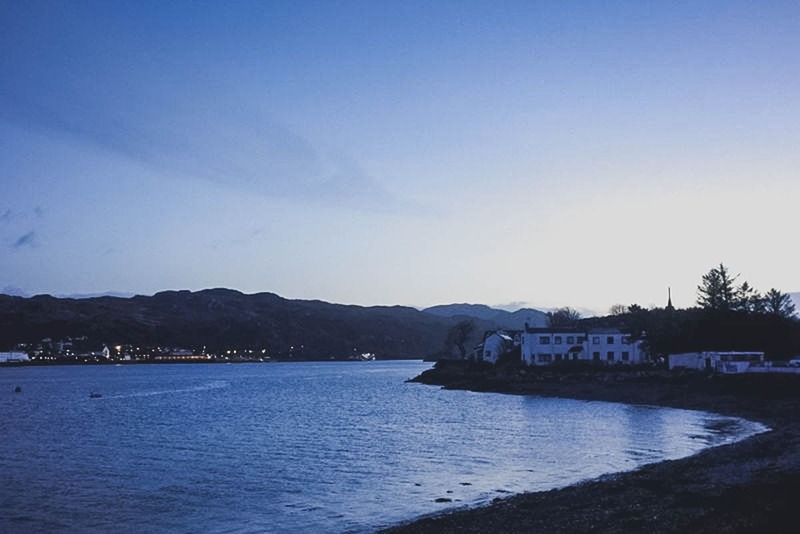 During the summer, when the days are longer, there’s a chance to cruise the Loch by boat. In the winter, however, it suffices to stand on the banks and keep watch. No Scottish adventure is complete without a visit to a whisky distillery and HAGGiS Adventures have got you covered on this front too. A stop at Tomatin whisky distillery gave me the chance to see how the famous brand produces its whisky and a quick sample finished the tour perfectly. On the return to Edinburgh we passed through the charming village of Dunkeld with a visit inside the beautiful cathedral. On the afternoon on my visit the frost still lay on the ground giving the cathedral ground a mysterious feel. 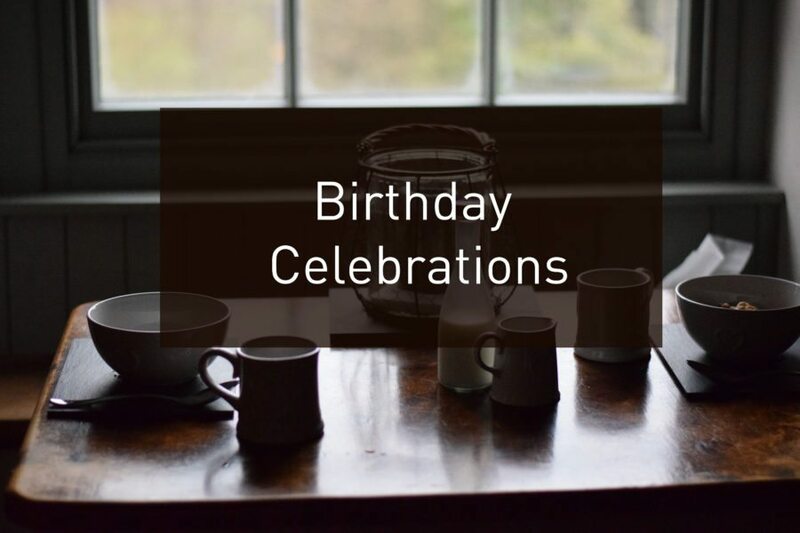 If you’re in need of a slice of cake, or coffee pick-me-up then pop into Spill the Beans café. The scenic entry into Edinburgh means passing over the Forth of Firth bridge. The bridge you cross over isn’t the main attraction however, it’s the red steel bridge to the right hand side that deserves the ‘wow’ factor. The 8,296ft long bridge over the Forth has been operational since 1890 and, unlike the road bridge which is in the process of being replaced due to weakness, looks like it will last for centuries more! Packing the following items will make your trip with HAGGiS Adventures all the more enjoyable. Your camera with an empty SD card! The Skye High Tour departs and returns to the HAGGiS Adventures office in Edinburgh. You need to checkin at 8.15am on the first day of your tour. On the Skye High trip you’ll go from Edinburgh to Loch Ness then over to the Isle of Skye and return to Edinburgh via Glen Coe and Stirling. 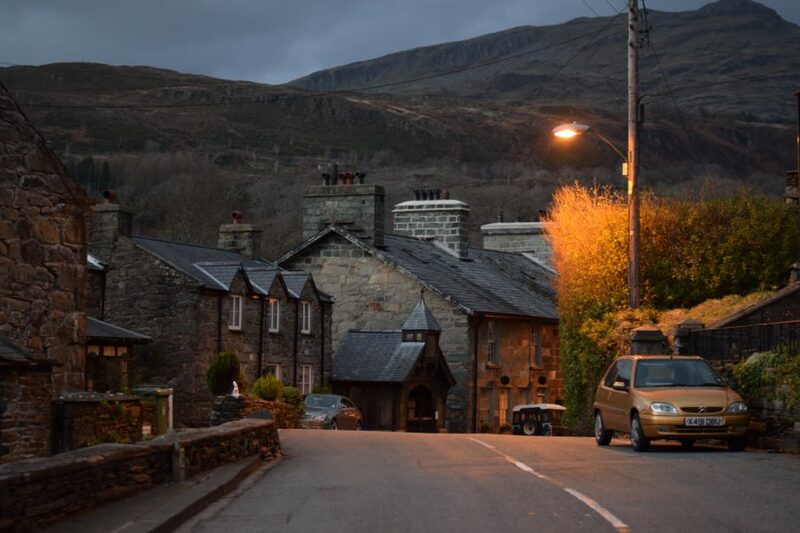 This tour costs £259pp + about £24pp for two nights of accommodation. HAGGiS Adventures reserve the accommodation when you book the tour and you can then either pay the accommodation at the same time, or pay upon checkin at the hostel. You can fly, drive or catch the bus or train to Edinburgh depending on where you live. I always book my flights through Skyscanner as they tend to offer the best deals on flights. 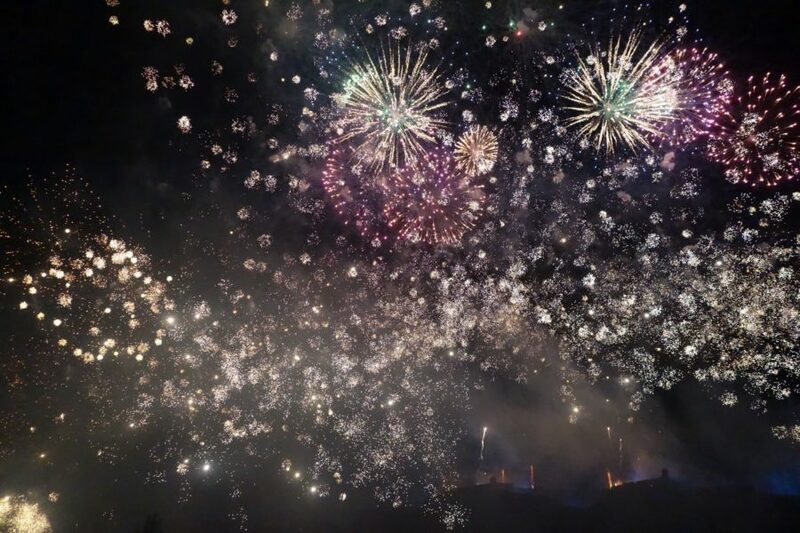 Edinburgh is a relatively small city so you can easily walk around it during the Hogmanay celebrations. Beautiful photos. I have a lot of family in Scotland, but have never been to Skye. It’s now firmly on the list! Gorgeous photos. I’m heading to Scotland for 10 days in April and Skye is high on my list. It looks so moody with all that mist. I live in Glasgow and yet I’ve shamefully never been to any of these places. I would love to go on a trip to visit an island (or two) though and Eilean Donal castle looks beautiful. I’ve now got another tab option with the Haggis Adventures website loading up! Not gonna lie, I totally wanted to visit Scotland after watching Outlander. If you haven’t seen the show/read the book, I’d recommend it! Your photos are so lovely! Happy to hear you had an awesome time. I went on their 3 day Isle Of Skye trip too and had such a blast. Definitely the best tour I’ve ever been on. The stories are fascinating, even though they are sad at times :/ and the views are just epic! Aw thank you 🙂 The trip is amazing isn’t it! So much beauty but yes definitely a lot of sad stories too, can’t imagine what it must’ve been like!